Thursday April 25, 2019 — PG&E is alleged to have caused the devastating Camp Fire that began on November 8, 2018 in Butte County. Lawsuits are now underway to compensate victims for personal injuries, property and business losses, and other legal damages. If you or a loved one was affected, contact our experienced mass tort attorneys to learn about the Camp Fire lawsuit and understand your legal options. All consultations are provided at no cost and with no obligation. On Tuesday November 6th, PG&E alerted customers that it may schedule a Public Safety Power Shutoff for November 8th across various Northern California counties, including Butte County. Planned shutoffs are intended to protect communities from known fire conditions such as strong winds, low humidity, and abundant dry vegetation. Over the next two days, PG&E tweeted 17 different warnings about a potential power shutoff scheduled for the morning of November 8th amid forecasts of sustained high winds and gusts reaching 40 to 50 mph creating an extreme fire danger. November 8th 6:15am: PG&E experienced an outage on its Caribou-Palermo 115-kilovolt transmission line located at Pulga Road across the Feather River from the Poe Dam. November 8th 6:33am: Cal Fire reported the start of the Camp Fire in the same area as the Caribou-Palermo outage. Additional trucks responding to the Poe Dam area acknowledged downed power lines as they arrived on scene. November 8th 6:45am: PG&E experienced a second outage on the Big Bend 12-kilovolt distribution line located east of the Concow reservoir near Rim Road. November 8th 7:04am: Firefighters dispatched to the Rim Road location reported a possible second origin point for the Camp Fire at or near PG&E’s Big Bend distribution line. PG&E reported to state regulators at the California Public Utilities Commission (CPUC) that aerial observation in the afternoon on November 8th showed damage to a high-rise transmission tower on the Caribou-Palermo line one mile northeast of Pulga on the west side of the Feather River, i.e., at the initial suspected origin point of the Camp Fire. 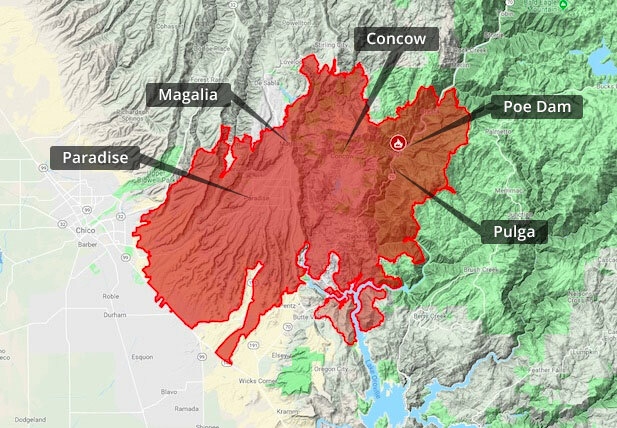 From its origin point in the mountains near Pulga, the fire rapidly spread west and caused devastation to the towns of Paradise, Concow, Magalia, and surrounding areas. Upon 100% containment of the Camp Fire on November 25th, Cal Fire reported 153,336 acres burned; destruction of 13,972 residences, 528 commercial structures, and 4,293 other buildings; 3 firefighter injuries; and 85 civilian deaths. Additional fatalities have been identified and reported since that time. Monetary damages from the Camp Fire are expected to exceed $15 billion. This disaster follows a long history of PG&E safety violations that have caused devastating fires and explosions. Prior events include the 1994 Trauner Fire (739 counts of criminal negligence and $24 million in penalties); the 2003 Mission District Substation fire; the 2008 Rancho Cordova explosion ($38 million in CPUC fines); the 2010 San Bruno explosion (6 felony charges and $1.6 billion in penalties); the 2011 Cupertino explosion; the 2014 Carmel explosion ($36 million in total fines); the 2015 Butte Fire in Calaveras County ($98.3 million in fines and costs); and 2017 North Bay Fires (44 fatalities and over 245,000 acres burned). Cal Fire continues to investigate the cause of the Camp Fire, and could refer the matter to the district attorney for potential criminal prosecution against PG&E. At the same time, the CPUC has launched a regulatory investigation into PG&E to assess the company’s compliance with fire safety regulations, including maintenance of its infrastructure, vegetation management, and emergency preparedness and response. Individual civil lawsuits are also under review for fire victims in Paradise, Magalia, Concow, and other affected areas. Is the Camp Fire lawsuit a class action proceeding? No, civil claims for Camp Fire victims are filed on an individual basis. This means you will have your own attorney to represent you, and your case will be resolved according to the unique facts of your case and the damages you experienced. In a class action, by contrast, a select few plaintiffs would file a single lawsuit on behalf of all victims with any recovery divided amongst the class members. No such class has been certified related to the Camp Fire. What types of damages are you entitled to pursue? While each case is different, common damage categories include: the cost to repair or replace your home and personal property; the loss of use and enjoyment of your property; depreciation in the value of your land; damage to trees, timber, or underwood; business losses; lost wages; loss of crops; harm to pets or livestock; emotional distress; personal injury; and wrongful death. Even if you have insurance, you will likely experience a shortfall in some areas of coverage as well as damages that fall outside the policy. How much work will be required of you if you choose to pursue a claim? The Camp Fire litigation is still in the early stages, but more than likely, your case will be coordinated into a mass tort proceeding. This means your level of personal involvement will be less than in a traditional, single event lawsuit. You are unlikely to be required to give deposition testimony, respond to burdensome discovery requests, or proceed through a jury trial. Instead, your attorney will work with you to gather proof of your damages and prepare your claim for potential mediation or pre-trial resolution. Will you have to pay any legal fees? No, our Camp Fire attorneys represent clients under a contingency fee arrangement. This means you do not pay any case costs, litigation expenses, or attorneys’ fees out of pocket. Instead, we recover fees and costs as a percentage of the amount recovered on your behalf and only if your case is successful. We invite your questions about our firm’s contingency rate and why we have lowered this percentage for our wildfire clients throughout Butte County. Will the attorney take any portion of your insurance payments? No. Our law firm does not claim any percentage of your insurance coverage payments. We wish to see you recover the maximum amount under your policy following this disaster, and we are available to offer guidance to you throughout the insurance claims process. What is the deadline for filing a lawsuit? You will have two years from the date of the Camp Fire to file a claim before certain legal rights expire. Nonetheless, we encourage recent fire survivors to consult an attorney in a timely manner. Your lawyer can help you document your losses for purposes of the PG&E lawsuit, as well as offer guidance on insurance and other matters that might arise. Of course, you should take the time you need to find housing, care for family members, and attend to your health and well-being until you feel prepared to discuss your claim. If you suffered damages as a result of the Camp Fire, you may be entitled to pursue a claim against PG&E for compensation. Claims include personal injury, property damage, business losses, and wrongful death. Our Camp Fire attorneys have over 25 years’ experience in mass tort litigation and currently serve as court-appointed leadership counsel in the North Bay Fire Litigation (JCCP 4955). Contact us by phone or through our brief online form at any time to discuss your claim and learn how we can help.